Kailasa temple is a famous rock cut monument, one of the 34 monasteries and temples known collectively as the Ellora Caves, extending over more than 2 km, that were dug side by side in the wall of a high basalt cliff in the complex located at Ellora, Maharashtra, India. It is a megalith carved out of one single black granite rock. It is estimated that about 400,000 tons of rocks was scooped out over years to construct this monolithic structure. It was built in the 8th century by the Rashtrakuta king Krishna I . 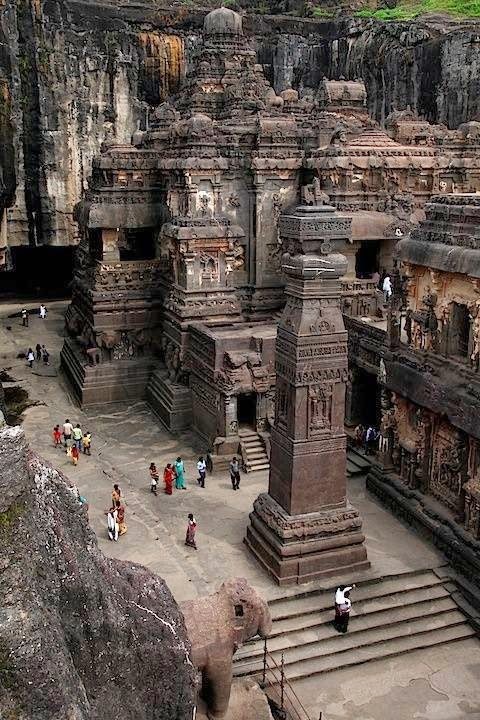 The Kailash Temple is notable for its vertical excavation—carvers started at the top of the original rock, and excavated downward, exhuming the temple out of the existing rock. The traditional methods were rigidly followed by the master architect which could not have been achieved by excavating from the front.